An anonymous and untitled treatise on compound remedies, with extensive marginalia. No other copy has been identified. Persian. 60 leaves (fols. 14a-73a). Dimensions 21.2 x 12.6 (text area 14.5 x 7) cm; 18 lines per page. No author or title are given. The text was transcribed by the same unnamed copyist who completed the second item in the volume on 22 Dhu al-Hijjah 1241 [= 28 July 1826]. See (MS P 7, item 2) and illustration of colophon in (MS P 7, item 3). The text is written in a small nasta‘liq script. The text area is frame-ruled. Black ink with maroon headings and overlinings. There are catchwords. On a number of folios, there is a marginal commentary that is written in the same hand as the central text. Two types of paper has been used in the volume: a creamy, glossy paper with neither laid lines nor chain lines, and a lightly-glossed gray-green paper that is watermarked (1824). The papers are mixed throughout the volume. The edges have been trimmed from their original size. The volume consists of 174 leaves. Fols. 1a-12b, 73b-75a and 174b are blank. Item 1 (fols. 14a-73a) is the anonymous treatise on compound remedies here catalogued. Item 2 (fols. 75b-166b) is Dastūr al-‘ilāj by Sulṭān ‘Alī Khurāsānī (MS P 7, item 2); and item 3 (fols. 166b-173b) is a medical compendium Zubdat al-bayān fī ‘ilm abdān by al-Asfarā’nī (MS P 7, item 3). All the items are copied by the same copyist. Fol. 13a has many owners' notes, and fol. 13b has miscellaneous notes that continue on fol. 14a. Fol. 174a has miscellaneous therapeutic notes written in Persian in two directions on the page. The volume is bound in a soft black leather binding. Both covers have blind-tooled frames enclosing rectilinear designs. The binding is illustrated in (MS P 7, item 3). There are pink paper pastedowns and modern endpapers. On fol. 13a there is an owner's stamp dated 1239 (= 1823) with the name Ibn Muḥammad ‘Abd Rafī‘ al-Ḥusaynī al-Wahhāb. There are also six undated owners' notes, one for ‘Abd al-Mudhanab al-Iṣfahānī. The volume was acquired by the Army Medical Library in 1946 from A.S. Yahuda, who acquired it from a dealer in Hyderabad, India (ELS 1686, Med. 42). Schullian/Sommer, Cat. of incun. & MSS., pp. 331-2 entry P 7. An anonymous and untitled collection of recipes for compound remedies. The volume is bound in a late 19th-century Indian binding of tan leather over pasteboards. 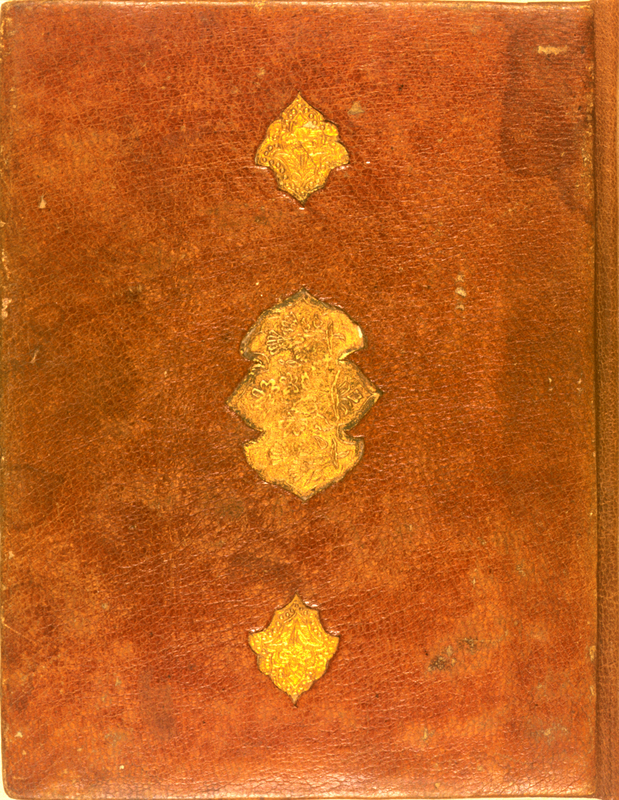 The covers (the back is here illustrated) have a central panel, and two smaller decorative devices, deeply impressed over paper cut to their contours and gold painted. The inner fields of the two smaller designs are filled with a single flower surrounded by a band of dots, while the inner field of the large panel has a number of flowers on stems. There are no frames surrounding the central designs. Persian. 4 leaves (fols. 125a-128a). Dimensions 20.3 x 14.8 (text area 13.8 x 9.5) cm; 15 lines per page. The copy is dated (fols. 128a, lines 11-13) 19 Muharram 1222 (= 29 March 1807). The copyist is not named. The hand changes slightly with this item, though it is quite similar to the hand that transcribed the first two items in the volume, but smaller. The text is written in a medium-small, widely spaced, naskh script using black ink with headings in red and red overlinings. The text area is frame-ruled. There are catchwords and red marginal headings. The ivory, thin, semi-glossy paper has visible laid lines, single chain lines, and watermarks. It is soiled by thumbing and has some ink smudges. The same paper is used throughout the volume. The volume consists of 128 leaves. Fol. 128b is blank. Item 1 (fols. 1a-122a) is Zād al-musāfarīn by Muḥammad Mahdī ibn ‘Alī Naqī (MS P 23, item 1), and item 2 (fols. 122b-124b) is the anonymous Risālah-i mujarrabāt (MS P 23, item 2), and item 3 (fols. 125a-128a) consists of the recipes for compound remedies here catalogued.. The volume is bound in a late 19th-century Indian binding of tan leather over pasteboards. 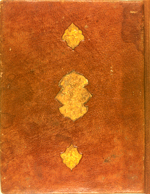 The covers (the back is here illustrated) have a central panel, and two smaller decorative devices, deeply impressed over paper cut to their contours and gold painted. The inner fields of the two smaller designs are filled with a single flower surrounded by a band of dots, while the inner field of the large panel has a number of flowers on stems. There are no frames surrounding the central designs. There are dark-blue paper pastedowns and modern paper endpapers. There is an impression of an undated oval owner's stamp on fol. 128b. The volume was in the collections of the Army Medical Library by 1941; no further information is available on provenance. Schullian/Sommer, Cat. of incun. & MSS., entry P23, pp. 337 (this item not described).